Watch our new Exeter History Minute -- Thank you, Mr. Swasey! If you live in or near Exeter, you’ve heard the name Swasey. There’s Swasey Parkway, Swasey Pavilion – better known as “The Bandstand” – and Swasey Park Pavilion. In this episode of the Exeter History Minute -- click here to watch -- Barbara explains the story behind all the Swasey swag. This history minute is generously sponsored by Service Credit Union. 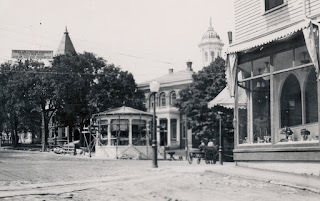 To learn more about Exeter history -- or to support the Exeter Historical Society -- visit our website, www.exeterhistory.org.